TAMPA, FLA. – The Browns will be undermanned, particularly on defense, when they face the Buccaneers down in Tampa Bay this afternoon. Cornerback E.J. Gaines, who has been filling in for the injured Terrance Mitchell for several weeks now, is one of two notable inactives for the Browns today. He’s currently in the concussion protocol. The other is Joe Schobert, who is dealing with a hamstring injury. Cleveland officially ruled that duo out on Friday’s injury report. 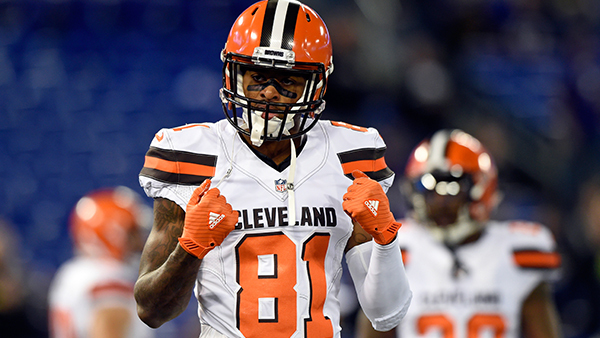 The rest of Cleveland’s inactives include third-string quarterback Drew Stanton, wide receiver Rashard Higgins, defensive tackle Carl Davis, and recently promoted WR Da’Mari Scott. Scott, who was just added off the practice squad earlier this week, is an interesting scratch considering the Browns enter Sunday extremely shorthanded at wide receiver already. With Higgins missing his second consecutive due to an MCL sprain, Cleveland will carry only four active wide receivers today. Meanwhile, the most notable inactive for Tampa Bay is disruptive defensive tackle Gerald McCoy. He was ruled out on Friday’s injury report with a calf injury. The Bucs will also be down another starter in defensive end Vinny Curry as well.